Mr. Pradip Baruah, the editor of Prantik speaks at Guest of the Month porgram about the secrets of his magazine. Is it possible for a magazine to survive in today's word without depending on the commercial advertisement revenues? Can a general magazine, supported by no organization but only by its readers, dare to avoid the advertisements just to endorse its principle? Or is there such an initiative in India or elsewhere? 25000 circulation. But amazingly Prantik is distributed in more than 25 countries including America and Europe. The editor of Prantik, Pradip Baruah revealed many of such surprises in an interactive session at Guwahati Press Club on December 20 last. Attending the programme titled 'Guest of the Month', Baruah said that initially they used to publish advertisements of different products including cigarette and hard drinks. In fact Prantik was pioneer in Northeast to accommodate space for coloured ads. "But many of our readers wrote to avoid such advertisements only because of some money. They even advised us to increase the price of the magazine instead of going for the advertisements of those unhealthy products. Then we stopped publishing such advertisements and made an official declaration in this regard. Later we decided not to publish any commercial advertisements, because many times it demanded unfair practices," Baruah declared. Answering various questions of the reporters, Baruah admitted that the volume of serious readers were not increasing as desired in the last decade, but he hoped that time would where more and more people start accepting the reading habit as their passions. He also expressed optimism that the identity of Assamese society would be intact even if the number of Assamese speaking people would reduce to few lakhs (now in crores) or they be out of political power or influences. It may be mentioned that Baruah started his magazine more than two decades back with the eminent litterateur, playwright and filmmaker Dr Bhabendranath Saikia as the chief editor. After the untimely demise of Dr Saikia, Baruah led the team to continue publishing Prantik from Guwahati with all his vigour and commitments. Guwahati, which is emerged as the virtual capital of Northeast, houses more than 20 major daily newspapers with thousands periodicals including magazines. Most of those are published from Guwahati and other places of Assam, where as some metro dailies have Guwahati editions as well. Though Assamese is the native languages for most of the people, English and Hindi are well recognised and accepted for communication by more than 26 million habitants in Assam. Wikipedia, the free encyclopedia describes Prantik as 'a multi-topic Assamese magazine published fortnightly from Guwahati since 1981.' It plays a vital role in the socio-political lives of the people of Assam, the internet encyclopedia added. "With every issue of Prantik, I actually pay my heartiest tribute to Sir (Dr Saikia)," revealed Baruah, who is also the publisher of the magazine. Born in Dibrugarh in 1938, Baruah started his working life in The Assam Tribune group of publications since 1960. The third son of RG Baruah, a legendary Assamese personality, Baruah continued working for the prestigious and the oldest media house in Northeast India till 1980. Then he came out with the idea of a magazine, which can nurture the rational needs of the society. "I want to maintain Prantik neither as a hot commodity nor a cold entity, but a warm creation," Baruah added. "When it (Prantik) started with a comprehensive approach covering almost all aspects of the State's society, it was accepted as a trendsetter by the readers. 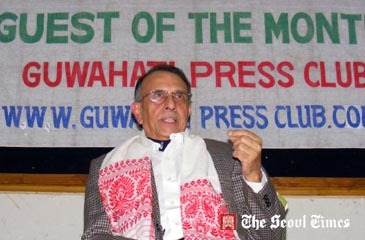 Though started with the established writers, in course of time, it created a new set of writers signaling the advent of another new era in the Assamese world of literature and journalism," commented Ajit Patowary, a Guwahati based senior journalist. Prantik today covers varieties of sections including politics, agriculture, industry, health, economics, literature, travelogue, film, theatre, art & culture with science and environment. Till date Prantik has created a number of writer-journalists. More over the magazine provides significant space for the readers, where they can raise issues, discuss about their concerns and some times talk about their personal feelings that might have social relevance. Samir Sandilya, a regular reader of Prantik since his childhood, observed, "I find it astonishing how a modern day magazine can deny to entertain the advertisers.' This is a well known fact that every media house in the country installs a smart and strong ads department as a priority. Media pundits often discuss about the growing influence of advertisers in editorial policy of a newspaper. Ads normally come with additional inputs to media space. And many times, it is observed that those inputs are really opposite to the original policy of the newspapers but the management fails to stick to their norm. However, another avid reader of Prantik, Lakshya Gohain apprehends it as a 'risk factor' for a largely circulated commercial magazine. "Moreover, I do not see any reason to reject commercial advertisements with contents those are not against social values," said Gohain while adding that we wants Prantik to survive hundred years with an aim to grow more and more enlightening people in the region. During interaction, Baruah disagreed that the new generation Assamese with English as their language of education would forget their own language. "I have many writers in Prantik, who had educated themselves in English medium, but write in Assamese. And they have proved themselves prolific contributors," he asserted. "I find the job to read hundred letters (to the editor) and select some of those for publication very passionate. Those letters, which may come from a remote village of Assam or a city of western countries, actually carry the feelings of the readers. It is not only exciting but also refreshing all the times," Baruah concluded.